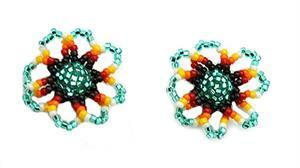 These flower post beaded earrings are crafted with seed and cut beads and have a beaded ball in the center. They measure approximately 7/8" in diameter and are crafted by Navajo artisan Geraldrita Whitethorne. Colors will vary.